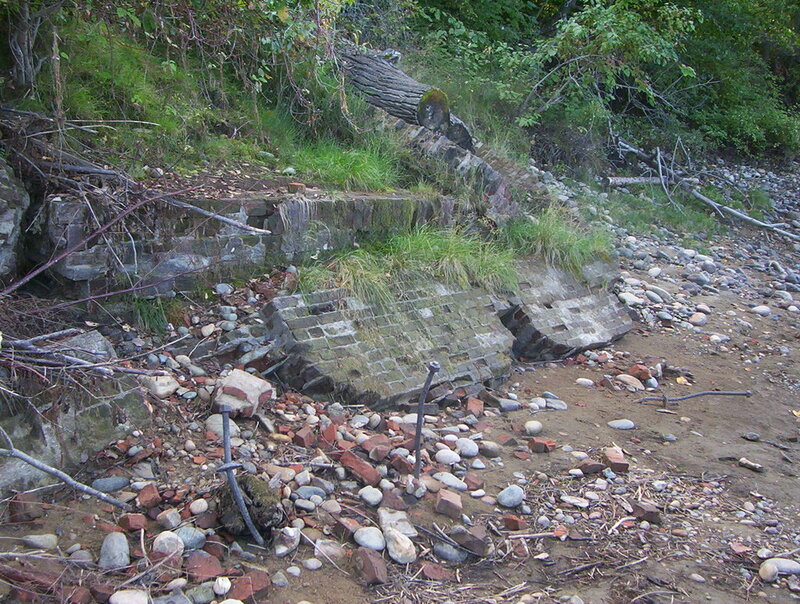 There is a ruin of a brick structure at the river's edge out past the boat launch. 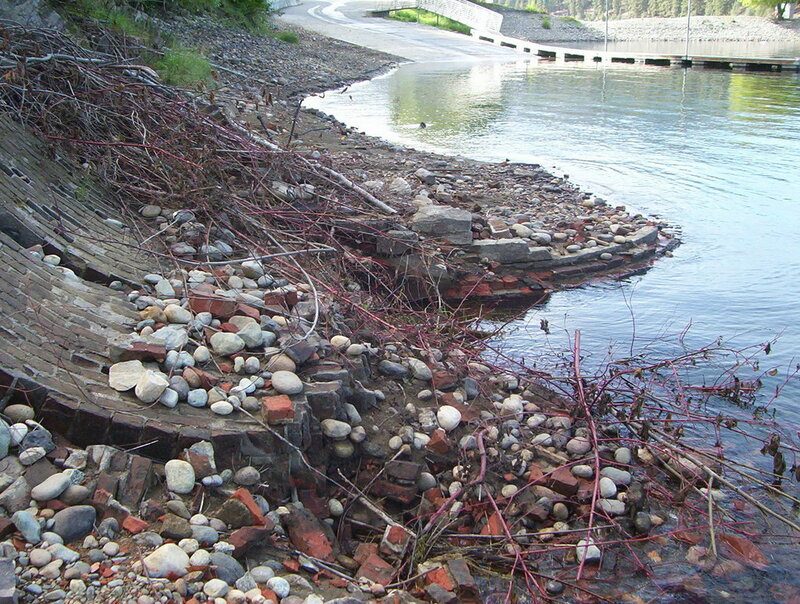 Dating back to the time of the smelter, what would have been it's purpose so close to the water? Even under water part of the year? It has been the source of much speculation over the years. As seen in the above photos, there is a foundation approximately 16 ft. by 32 ft. with ends that are round, massive fallen down walls 30 in. 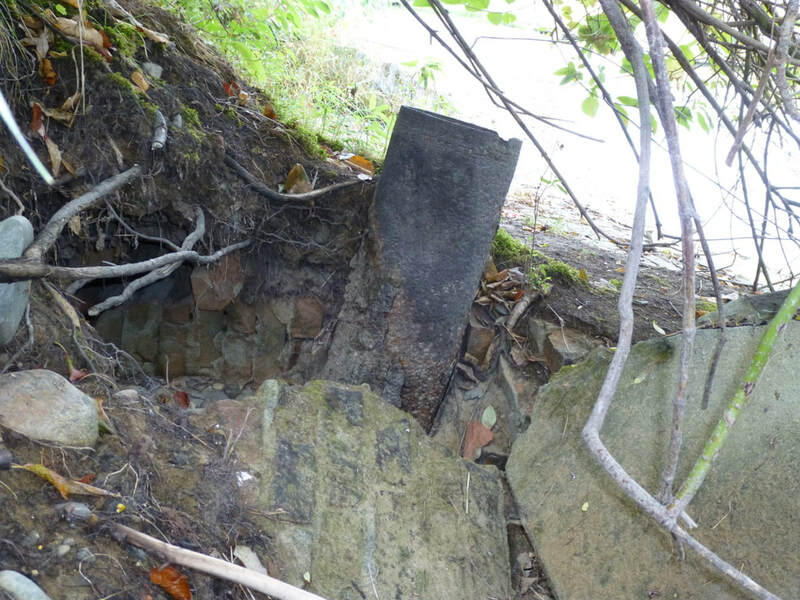 thick, beams and long bolts embedded in the floor, a nine inch diameter steel pipe stub and according to a local informant, there was a buried, brick lined tunnel running up the hill at a steep angle. The upper photo shows what the area looked like in 1901. Water was supplied to the smelter by means of a flume beginning at Deep Creek falls and running about two miles to two large storage tanks on the hill behind the smelter. There is a visible trace from the tanks to the general area above and beyond the present day boat launch. This trace follows a pipe visible in the lower 1899 photo. The pipe may have been buried, leaving the trace. 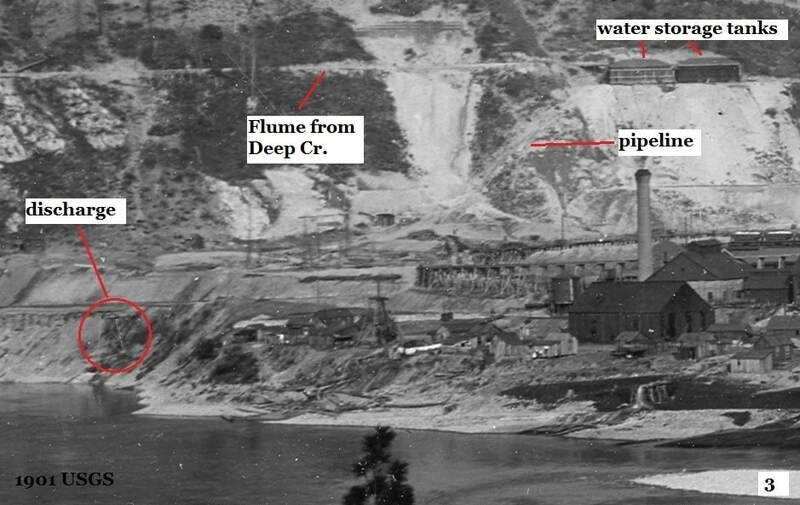 There is a pipe on a trestle discharging water into the river, circled in the 1901 photo. It is believed that this discharge is overflow from the flume for the times when there was more water coming in than the smelter could use. The management is engaged at the present time in digging ditches, laying pipes, and putting in a large pumping outfit to the river, so that in the event of the present water system getting out of order or the supply proving inadequate no close down will be necessary for lack of water. Their concern over water supply was well placed. The Northport Smelting & Refining Company is in a fresh difficulty. 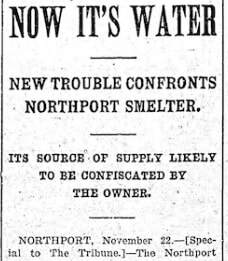 Its water supply is threatened by Robert Morrill, owner of the Northport Electric Company, who owns Deep creek falls, about a quarter of a mile above the head of the smelter company's flume. Mr. Morrill is fresh from a victory over the Anaconda smelter of Anaconda, Montana, from whom he collected $50,000 in a suit over real estate adjoining their plant, and it is likely he will make things extremely interesting for the Northport smelter company. The smelter gets its water supply and that for the city's system, which it owns, from Deep creek, through a flume about a mile and a half long. Mr. Morrill is building a sawmill at Deep creek falls and 10 o'clock Monday morning last he found It necessary to close the gates of his dam. As a consequence the creek went dry and the smelter water gauges began to fall. The master mechanic and a number of men went out to the falls and requested Morrill's men to open the gates of the dam. This they refused to do. 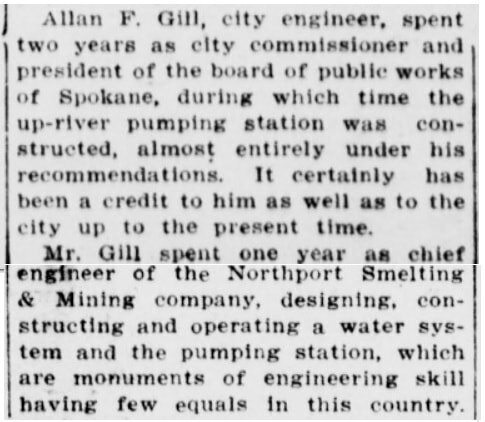 The smeltermen threatened to demolish the dam, but Morrill's men refused to be bluffed and the smelter was compelled to close down for some time, as the water was not turned on again until 1 o'clock Monday afternoon. In the meantime two of the furnaces froze up and some other damage was done to the plant. Mr. Morrill's water right was located prior to that owned by the smelter company and it seems likely that he will be able to do pretty much as he likes with water matters until the smelter company accede to what ever demands he may make, as the Deep creek water supply is practically the only one available for the smelter's use unless they pump their water from the Columbia at an enormous expense. The end is not yet. The brick structure could have housed this "pumping outfit". The overflow pipe was already in place and could be used to pump river water up to the tanks, the beams and bolts in the floor would have been to mount pumping equipment, and the massive walls and rounded shape would have been necessary to protect the equipment from the pressure of high water on the river.